The weight management doctors confess and warn that food addiction is a more powerful addiction than tobacco, alcohol, cocaine or even heroin! What exactly are compulsive eating behaviors and disorders, and how do they affect many of us? Remember being told that you should eat to live, not live to eat! That statement could make you upset! I really love food, love to prepare it, love to sit down and eat it. Does this make me a foodie or an addict? Well, the difference I believe is sociological. Everything comes down to motivations. What are your actual pleasures from the food? For the foodie, it’s the challenge of the recipe. Its finding the right ingredients to blend together in a unique way, planning the event, inviting friends to enjoy, hearing your foodie social group take pleasure in your creation and the slant you put on your spices, sauces and presentation that makes you satisfied with the food and gives you such pleasure. Sure, you have some and appreciate your wonderful creation, but, more importantly, what a great job you did putting the dish together! 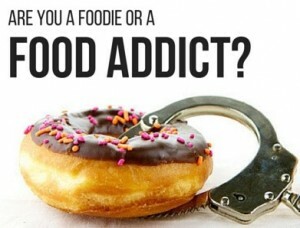 But maybe you’re a food addict, and maybe with a compulsive eating disorder in the disguise of a foodie. For the food addict, it’s very different. It’s more about the pleasure of the food itself, the plate of food is your best friend at that moment in time and the satisfaction and pleasure it can give is an uncontrollable draw. The dopamine release from eating the food is so mistakenly pleasurable. Maybe you overeat until your stomach hurts, your blood pressure rises and you just can’t seem to stop because you need to get as much dopamine pleasure as you can. Or maybe you’re preoccupied with filling your day with thoughts of food. It seems like once you get your taste buds salivating on the thoughts and visualization of food, you can just not stop. Night eating, day eating, snacking, eating your leftovers from dinner two hours after dinner, when you can just barely fit it. The addict may desire to be completely full, right up until bedtime. The addict, when given the choice between a small plate restaurant or a buffet, usually chooses the buffet. Here there are many favorite choices and plenty of food to create the biggest pleasure high possible. Jokingly, food addicts can say to themselves just before walking into a buffet or huge meal experience, “I’m really going to hurt myself now!”. They know they will feel crappy in no time, but cannot resist or control themselves or how much they eat, they are addicted and food is their drug of choice. Pleasure now for pain and consequences later is perfectly acceptable to them. Health problems do not deter the food addict, weight gain and all the side effects on the body do not dissuade them. Looking to doctors with blood pressure problems, diabetes, digestive disorders, obesity just to name a few. justified to indulge and get your high without anyone knowing or questioning you. Food addiction is very high in the United States, the land of plenty. Many addicts are trying to hide their problem. Many sins are hidden from other’s eyes, but the food addict is exposed in many ways, with outward signs of their weight gain and obesity for everyone to see. Others cover up their addiction with the complicated illness of bulimia. Excuses include “It’s in my gene’s.”, “I have an over active thyroid.”, “I have always had extra weight.”, “I am big boned.”, “I have a low metabolism.”, “My whole family is this way.”, “I am very happy at this weight leave me alone!”. More powerful an addiction than heroin, alcohol or cocaine, how do you stop the excuses, how do you heal this, how do you rehabilitate from a food addiction? With drugs or alcohol you start a program like AA or NA. Or you check into a center and they take your pleasure source – your drug of abuse away from you and in 3-6 months you are off your drug and no longer feel the intense draw of it! Your body seems to have found a way to no longer crave and need it anymore and hopefully your mind as well. Try this with food, and avoid eating for 6 months…Really? You would be dead! You’re told to take your pleasure, your addiction and just cut it back drastically and add some exercise. Diet – this is a dirty detestable word to the food addict. So how do you rehabilitate from food addiction, is there a pill for this? Well, there is Over Eaters Anonymous, and they certainly can help, but after the meeting where you confess your addiction, it’s off to lunch! Smaller portions, diet and exercise, low carb, Atkins, South Beach, on and on it goes, making you dizzy! It’s back to the satisfaction, pleasure and high you get from your addictive substance -food – and cutting this pleasure off is key. Food has to stop being fun and a pleasurable high for you somehow. Your food needs to stop triggering your addiction. Your food truly somehow has to take on the “Eat to Live” mantra and not the “Live to Eat” destructive behavior you have personally experienced. Not making food a special event, not aligning yourself with the pleasure is what it’s going to take. LC-Foods is in the process of developing products to help. These products are purposely “Flavor Neutral” or not particularly super delicious purposely , with not a lot of excitement or attention for your taste buds or salivary glands. These are truly “Eat to Live” products designed for the weight manager and food addicted person in mind. The first of these are the LC-Nourish Cubes® and LC-Fiberfill Drink Mix®, The vegetable smoothies and more to come. These products are ideal for the compulsive eater trying to navigate their way out of their addiction, while they focus their lifestyle away from living to eat to the better choice of eating to live. Remember to consult a physician before starting any diet regiment.